Welcome to the Weekly Digest! We are only 40 days out from TC17 and I am incredibly excited to meet so many of our amazing community members at my first Tableau Conference! Here is a link to register if you haven't had a chance to yet. I will be working with the community team, and supporting a couple Data + Women sessions, but since this will be my first trip to Las Vegas in about a decade I thought it would be fun to see what great vizzes are out on Tableau Public around the "Entertainment Capital of the World!" 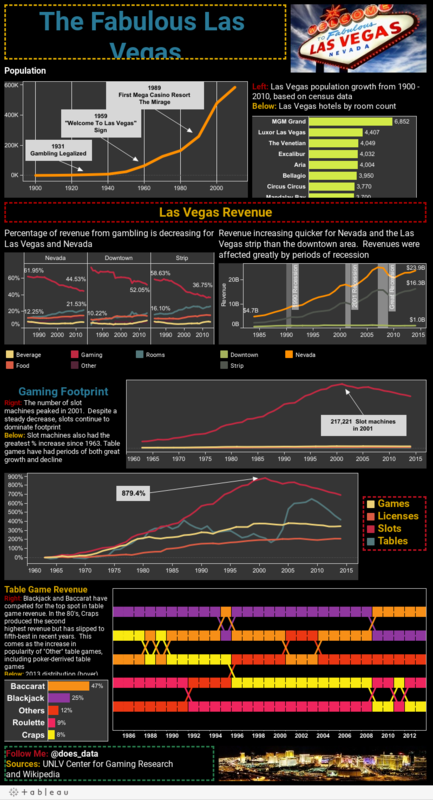 Ahead of the 2015 conference Branden Fulton created this "The Fabulous Las Vegas" viz including how blackjack and baccarat had gone head to head to get the top spot in table game revenue. Do you know of any other great vizzes or data sets on Las Vegas? Please share in the comments below! Ahead of this year's conference Tableau Zen Master Andy Kriebel is helping to support vegans and vegetarians with his "Viva Las Vegans!" viz, which was an Iron Viz entry. It's incredibly practical and useful - and has already been optimized for mobile viewing. Nice work Andy! + Our fearless community support lead Patrick Van Der Hyde is out in the great wide open hiking the John Muir Trail! If you would like to learn more about America's National Parks check out this great viz from Tableau Public Ambassador Pablo Gomez: The National Parks Have Never Been More Popular. With data from the National Park Service, Pablo looks at visitor data over the last 100 years. Download the workbook data and see what you can find! Christopher Carucci started a conversation on August 18th on Filter Dashboard based on User department. The thread has 18 replies, has been marked as helpful 3 times, and has been viewed over 200 times. It looks like they may have given up for now .. but if you are able to solve this problem and dig in on some Boolean Logic check out the thread. THank you to everyone who has contributed to help solve this and the thousands of questions and comments shared this week. The top voted idea this week is Conditional Formatting of Measure Names/Measure Values originally contribute by Jonathan Drummey with 999 votes for this Idea and 30 comments. There has been conversation around this idea since 2012. Do you have any recent use cases or information you would like to share? Follow the link to learn more, and vote the idea up or down. Tableau Program Manager Alyshia Olsen recently shared the thread Do you create dashboards where you are not the primary user? We want to hear about your workflow! We would love to get some feedback on her survey. Just reply to her thread and she can send you more info directly. It should take about 10 minutes so please take some time this week and share your thoughts! The last great eclipse in the US was in 1991, so don't miss the incoming one, in 6 hours! That will be 9am in Seattle for reference. Today we will discuss about gaming. This week in Europe, the biggest Gaming convention will kick off: the gamescom 2017! It is the world's second largest gaming event with more that 350,000 visitors, 6,000 journalists and 700 exhibitors from more than 90 countries. I am going to the event again this year in order to discover the news from gaming companies, try out their novelties and also interview the developers in order to share their precious information to the gaming communities, online. Cologne is also a beautiful city, I can't wait to visit new areas. I would be more than happy to meet with you on-site if you are attending, to discuss games and Tableau's analytics around some drinks! Check out this great viz from Victor Perazzolo about players' movement patterns in the WoW continent maps. It can be filtered by Race, Class and Level. Do you have any great gaming viz to share with us? + Have you checked the July edition of Best of the Tableau Web? As always, there’s a great variety of tips and tricks for every level! Best of the Tableau Web: It's all about community! + The Fringe Festival APAC is only 4 days away! Register to hear tips & tricks on visualization, design & much more! This week, Deepak Rai replied to 59 threads while having 12 of them marked as correct and helpful! Thanks everyone for helping the Tableau users! Kevin Denman wanted to configure his Excel Workbook in Tableau server so he could update the excel file and push it to Tableau server. While he was looking for a way to configure a data flow pointing to the local file path, Jonathan Drummey put on his super-hero mask & suit (no cape! ), and he delivered this very detailed answer: Can I use a desktop excel file as a live data source for Tableau Server? Paul Miller needs Tableau to pass the user through to Snowflake so that when Tableau executes a query to a secure view that he created, the query can call the appropriate Snowflake database function to filter the result by that user. Many users are also thinking this would be an excellent idea! What about you? Have a great week, and until next time, happy analyzing! Happy Monday - I raised awareness a few weeks ago about the solar eclipse but it's nearly here (next Monday). I didn't want to let the theme pass us over quite yet. 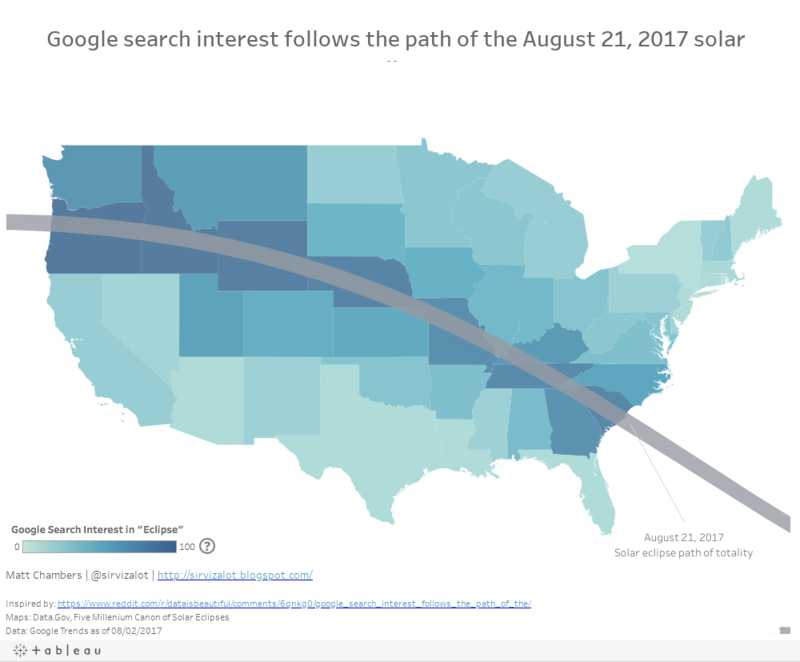 Zen Master, Matthew Chambers created a post and visualization examining the relationship between interest in the eclipse and the path of the eclipse. Learn how Matt created that great eclipse path across the USA in his article. + I will be on vacation for the next several weeks as I am set to begin my hike of thehttps://en.wikipedia.org/wiki/John_Muir_TrailJohn Muir Trail on Tuesday, August 22nd. Congratulations to our community Ambasador Zhouyi Zhang (ZZ) for achieving the Answer Wizard badge! The Answer Wizard badge marks is received after 100 people have marked your answer 'Correct'. This is a huge milestone in the Tableau Community forums that only a handful of members have achieved. Thank you ZZ. Indre White asked a question about ranking data for the current year but showing data across several years. Ambassador Joe Oppelt and Shinichiro Murakami both jumped in to assist Indre with this challenging question. Joe went the Table Calculation route and Shin chose to use a LOD calc. This is a great example of how you can use different methods to arrive at a result in Tableau. Both offer an opportunity to learn more advanced techniques/tools. The top voted idea this week is Ability to Rename Workbooks on Server originally contribute by Michael Lee with 579 votes for this Idea and 119 comments. There are some conflicting ideas about what and who should be allowed to change a workbook name. What are your thoughts? Vote and share your comments. Learn how Zen Master Christopher DeMartini analyzed movie scripts with Tableau - Analyzing Movie Scripts with Tableau | Tableau Public . A truly fascinating look at what's possible with Tableau. Happy Monday all - hopefully everyone had a great weekend and you found a way to beat the heat! It seems the worst is over for Seattle, but we are also keeping a watchful eye on our EMEA friends and the 'Lucifer' heat wave. My name is Patrick Byrne, I was raised in the Seattle area even though I was born on the East coast (Delaware). I love to attend live music of all sorts, as well as venturing to the outdoors for camping (from car to backpacking). I started my career with Tableau on December 31st, 2015 as a Technical Support Specialist, moving to Technical Support Engineer the following October. Working in Tier1 of Technical Support for a little over a year and a half I have gained invaluable insight into customer frustrations as well as technical knowledge of the Tableau products. Moving forward, I am beyond excited for our upcoming product lines (Project Maestro and the implementation of Hyper) and to tackle the challenges of supporting brand new products. I look forward to working with all the various teams and departments. Feel free to reach out and say hello! Congratulations to Kaz Shakir and Michael Someck for achieving the Questions for Breakfast badge! Thank you both for helping so many people in the community - it has not gone unnoticed! We hope to continue see you around. Tim Boudreau had a question about Map won't load - too large of dataset? He is trying to plot 100,000 latitude/longitude points on a map overlay. Catherine Brown has been helping to troubleshoot, but this remains unanswered. Check out the thread and see if you can help Tim find a solution. The top voted idea this week is Multi-Values Parameters by Loïc Grange with a net of over 1,200 votes and +5more just from the last week. There are 121 comments on this Idea. Lari McEdward, a Tableau employee and training expert, shared a great viz on 5 Millennia of Eclipses with data from NASA on Tableau Public. We would love to hear your eclipse viewing plans if you are in North America!